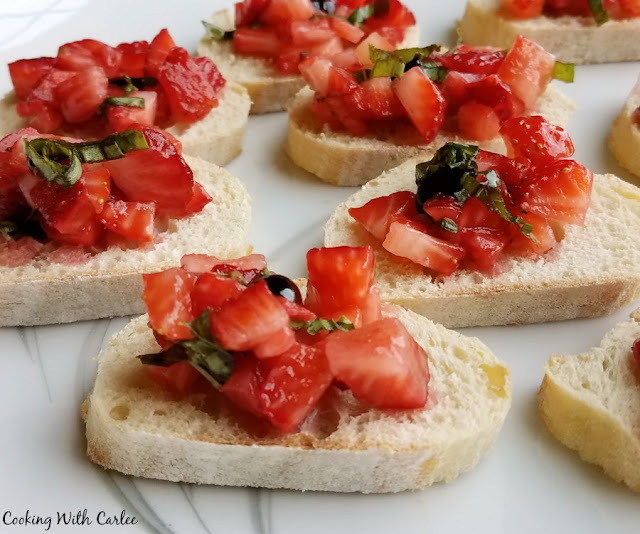 Have you ever tried bruschetta with strawberries? It is so good! Strawberries and basil make the perfect topper for a good baguette. Even though our strawberry patch has been done producing for weeks, the berries have been so cheap at the store we have still been swimming in strawberries. At the store the past few weeks, I have picked out a pound or two of berries and then my little dude will beg to get one too. He packs his own bag with his stuff at the grocery store and he needed his own berries for his bag. You know by now that I am a sucker when it comes to this stuff, so of course we get the extra pound of berries. Every. Single. Time. So with two or three pounds of berries to use in addition to the few pounds of peaches we have been buying every week we have been eating a lot of fruit. This week we had the addition of about a dozen kiwis because he LOOOOOOVES kiwi and always wanted more kiwi. Of course this makes it sound like we didn't just have the mega pack at the house two weeks ago, I assure you we did. Now the garden is suddenly going crazy. So I am feeling a bit of pressure to work through produce quickly before it goes bad! The herb garden is also going crazy. There is basil, basil and more basil. So I couldn't help but to whip up some strawberry bruschetta for an impromptu backyard picnic last weekend. We had some cheese, crackers, sausage, cherries, strawberry bruschetta and of course a kiwi. 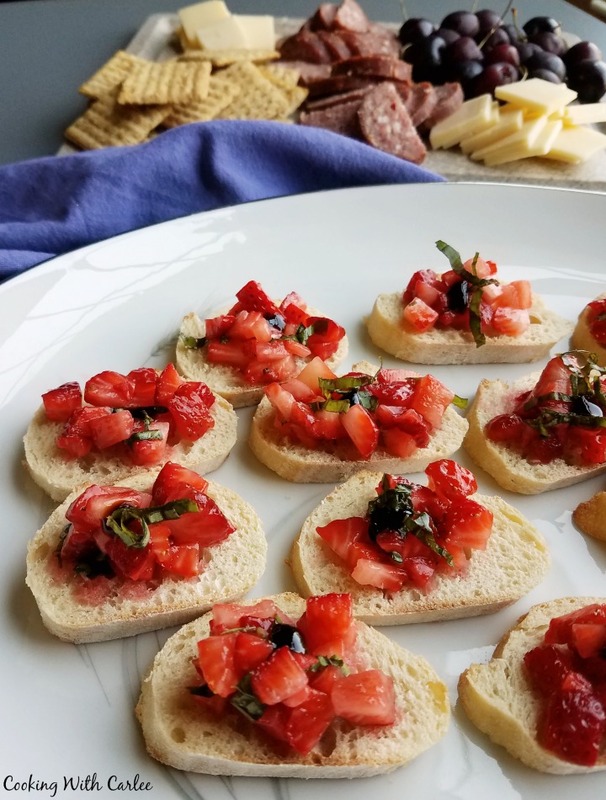 I have made this bruschetta quite a few times now, so I am not sure why it surprises me how much they enjoy it every time. My husband kept going on about how much he liked it and Little Dude told me it was his favorite thing. The basil chiffonade on top originally threw him for a loop. He generally doesn't like the green stuff on his food. He was also surprised when the balsalmic glaze wasn't chocolate sauce, but he still ate two or three and kept telling me how much he like them as well. Usually I make this very simply. 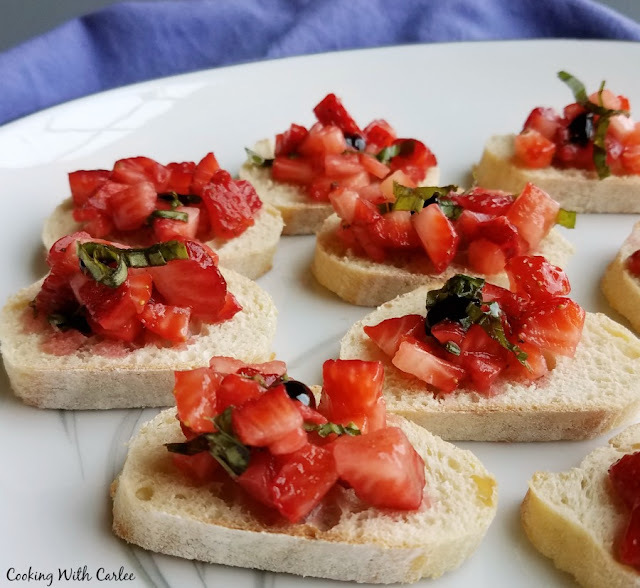 Just chop the berries, add a bit of lemon juice, sugar and basil and put it on top of baguette slices with a bit more basil and a dot of balsalmic glaze. But sometimes I use sliced berries instead.... and sometimes I get a bit carried away and put a schmear of cream cheese or goat cheese on the bread first. You just never can tell what mood is going to strike! Luckily it is always good, no matter what the final presentation ends up being! 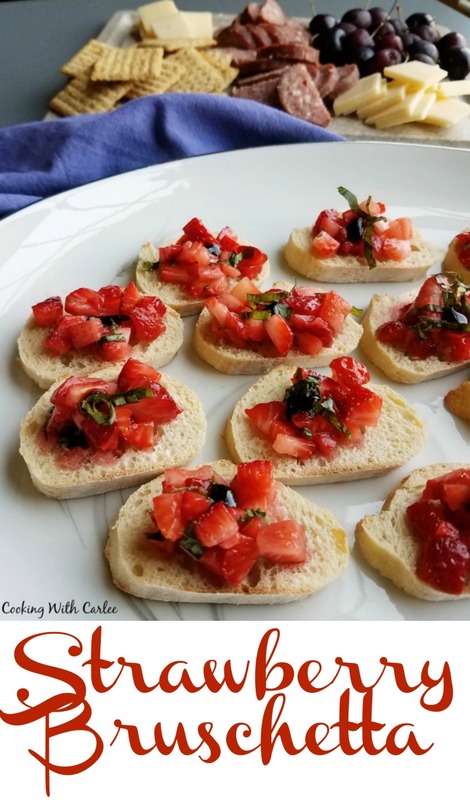 These bruschetta makes a great spring time starter, fun picnic fare and I think they would be great served at a bridal or baby shower. But as we proved last weekend, there doesn't have to be a special occasion. Sometimes you just need a blanket, a shade tree and an extra pound of strawberries! Stir together diced strawberries, lemon juice, sugar and basil. Set aside to let the flavors meld. Toast bread for 5 to 10 minutes. you want it to be crisp enough to hold up the the toppings but not really take on much color. Schmear each toast with cream cheese or goat cheese if you are choosing to use it. Give the strawberry mixture another stir. Then distribute on the toasted bread crisps, leaving most of the juice behind. Garnish with a light drizzle of balsamic glaze and additional basil. Oh wow, Carlee - I have never tried it. I've seen pictures but always thought it was some weirdness - but then no-one ever explained the flavors like you did. Now I'm going to have to try it! I had to chuckle about the balsamic/chocolate confusion! He's so darling! 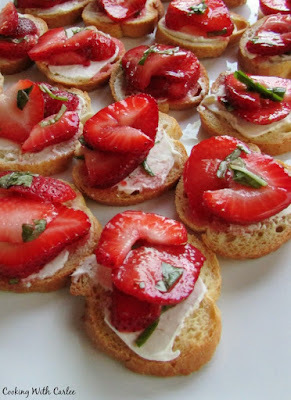 I'll admit the idea originally struck me as odd too, but it is one of our favorite spring and summer starters now! And isn't it funny about the balsalmic/chocolate sauce? He stuck his finger in the dot of reduced balsalmic and had it in his mouth before I could say anything. Definitely not chocolate! Despite the surprise, he liked them! I can get behind pretty much anything when it's piled on a slice of baguette :). This looks absolutely divine! And I'm with you on getting allll the berries at the store right now--they just look so good I can't resist! Have a great weekend, Carlee! It's hard to go wrong with crusty bread and piles of berries! Thanks so much, Kelsie! You and Cookie enjoy your weekend as well! This sounds really good. Isn't it true that sometimes you don't need a special occasion. Sometimes we just need to eat - right? Thanks for sharing. That's all the excuse I need most of the time! It is kind of fun to do it up a bit for no reason at all sometimes too!